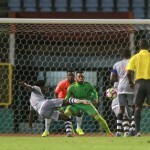 Central FC custodian Jan-Michael Williams and DIRECTV W Connection goalkeeper Jelani Archibald were the heroes last night as Pro League leaders, Central, and defending champions, Connection, played to a goalless draw in an entertaining Couva Clasico at the Ato Boldon Stadium. 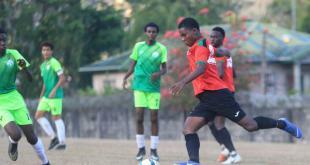 Photo: Stand-in Central FC captain Jan-Michael Williams enjoys a light moment during his previous Pro League outing against North East Stars. 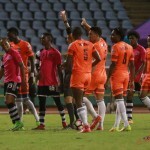 The result means that Central maintain their five-point lead over Connection although the latter team has a game in hand. 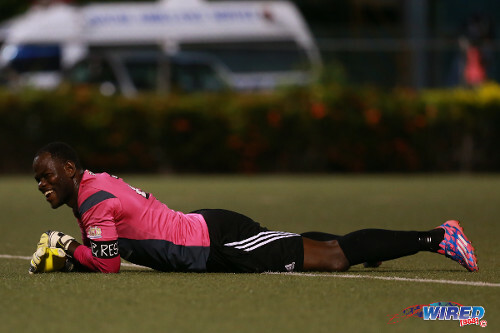 Earlier at the same Couva venue, Point Fortin Civic star Marcus Joseph maintained his impressive hot streak with his 11th goal from as many matches although it was only enough for a solitary point as a late Glenton Wolfe item meant a 1-1 tie with North East Stars. The 23-year-old Joseph, who was last season’s top scorer, is the Pro League’s most prolific player thus far despite spending the first half of the season abroad. Photo: Veteran San Juan Jabloteh poacher Kerry Baptiste (second from left) celebrates a strike against St Ann’s Rangers last season.